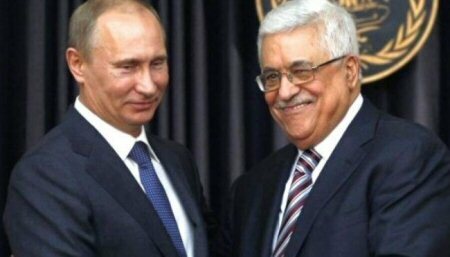 PA President Mahmoud Abbas met, on Saturday, with Russian President Vladimir Putin at the Kremlin, in Moscow, where they discussed the latest developments in Palestine, particularly Israel’s plan to demolish Khan al-Ahmar community near Jerusalem. They also discussed issues of mutual concern for Russia and Palestine, and praised the historical relations between the two countries, according to WAFA. Abbas is in Russia to attend the World Cup football match on Sunday, at the invitation of FIFA president. He is accompanied on this trip by Jibril Rjoub, head of the Palestinian Football Association and the Palestinian Olympic Committee.